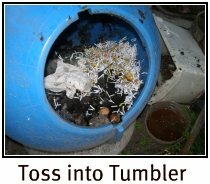 Why composting tips for compost tumblers? When you buy a compost tumbler you probably figure you've bought a perfect making compost solution. A unit that will handle all your biodegradable garbage with incredible ease. A composter that keeps everything clean, neat and tidy and at two week intervals rewards you with a rich earth compost. However, a surprising number of people end up with an expensive tumbler they have trouble turning and either a barrel full of material that hasn't rotted down at all or that is now full of a wet, stinking, rotting mess - that they can't somehow even get out of the composter because they can't turn the darn thing. Oh - did I say that out loud? If you're used to making compost in a simple pile built over some time on a bit of ground and left to break down for several months to a year remember you have all nature's resources waiting in the wings to fix your mistakes. Not so with the closed system now on your deck. Give your tumbler a chance to work well by paying attention to these composting tips. Activate by adding a bit of compost, soil, horse manure or purchased compost activator. Add a balanced mix of materials with a Carbon Nitrogen ratio of about 25. Shred your compost materials to small sizes. Make your compost a batch at a time - or more simply stop adding materials and let the process complete. Keep moist - as wet as a squeezed out sponge. Your new tumbler is a sterile place. The whole compost process happens because of the living decomposers in nature. They are definitely not present in your new composter. Your kitchen scraps and yard wastes will naturally be covered in some of the bacteria and fungi you need to get the compost cooking. However, to give your first few loads a boost add a handful or two of compost if you have some available, or healthy soil, or horse manure. If none of the free stuff is readily available buy a compost activator. You'll need it only for the first couple of batches. Don't clean your compost tumbler between batches. The bits of material left in the composter will activate your next batch. Expect your first few loads to take longer to break down. A compost tumbler is a closed system, and one you are hoping is going to churn out finished compost in 2 or 3 weeks. If you have the right balance of nitrogen rich green material and carbon rich brown material - in other words a Carbon Nitrogen ratio of about 25 - there is at least some hope that you will succeed. 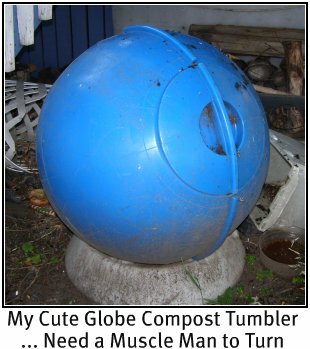 Too much of one or the other will turn your tumbler into an expensive contraption that stores either guck or fluff and has little hope for getting to finished compost anytime soon. For composting tips on getting the right mix check out our compost ingredients page. There you'll find list of many of the materials you will be adding to your tumbler along with their C/N ratios. The tumbler will mix this up but it is worth doing a little premixing of your own. 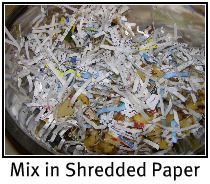 Mix up a bowl of kitchen scraps with some shredded paper then add the mixture to the unit. It always speeds things in the compost up when you chop or shred your materials before adding them. In a tumbler this is more important. First of all you spent serious money to buy the tumbler and you likely want your compost fast. Leaving it all in the tumbler for a year to slowly decompose I'm betting isn't in your plans. Chopping material into smaller bits makes more surface area available to the bacteria and fungi who will be at work breaking this stuff down. This really speeds things up. Second, with any luck you won't have your back up shredders - little animals tunneling about, the earthworms churning through the ingredients, and the larger insects that would help by shredding materials in a pile located on the ground. Don't add them to your tumbler - it will get too hot for them and they won't be able to escape. Here's a composting tip. Look in your kitchen and office for tools to shred your compost materials. 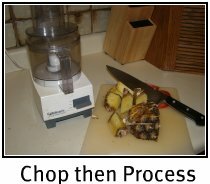 With kitchen scraps and ideal shredding tool is a food processor. A couple of pulses and your materials will be perfect for the tumbler. Or you can chop stuff with a knife, kitchen shears or pruners into smaller 1-2 inch pieces. 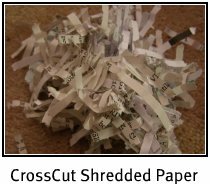 For paper I use a cross cut paper shredder. It kind of wrinkles up the bits of paper a bit so that you have air pockets and less matting. Tumblers are small batch composters. Think of a batch of cookies. You add your ingredients, mix them up, then bake. You don't open the oven half way through and add more flour and then pop them back in the oven. A batch composter is a bit like baking cookies. Keep adding your ingredients until your tumbler is almost full. Don't fill it all the way or the contents won't mix. Then stop adding new material. The time - the promised two to three weeks to convert that stuff to compost - starts when you stop adding stuff. Hardly anyone gets finished compost in two or three weeks. At the two week period the compost might broken down enough to move out of the tumbler and either mulched around your garden or left to cure for a few months. Buy two compost tumblers and fill one while the other bakes. Buy one of the dual compartment composters such as the Jora composter, or the Compost Twin. Get a lidded bucket and layer your waste with some sawdust or shredded paper. Then add the whole bucket to the tumbler right after you empty the tumbler. Below are links to products on Amazon.com that may be good for you. I like the Jora tumblers as they were designed in Sweden and are well insulated for use during the winter. But I am in Canada where it is cold. The compost starter is not absolutely necessary but a new tumbler is pretty barren so it may be useful for your first few batches. Moist as a squeezed out sponge is at times an elusive goal. Happily, because the system is closed with of course some sir coming in it does tend to keep a steady moisture level. People in desert area will find a tumbler keeping the material moist. Those living in areas with lots of rain will find the tumbler keeps the compost from getting soggy. If the moisture level is wrong it's because of what you put into the barrel. If things are too wet it will start to stink. If it is too dry it will stop breaking down. Here are a couple of composting tips for adjusting compost moisture. If things get too wet get your hands on some wood stove pellets. They are brilliant at reducing moisture in the tumbler and it's easy to add just the right amount - just a few pellets at a time. Pick them up at a local hardware store... way cheaper. If you can't find them use dry saw dust or shredded paper. If the contents are too dry add water a cup at a time turning the composter after each addition. Some tumblers are easier to turn than others. I really have trouble with my beautiful blue globe for example. When you choose your tumbler recognize that to get compost fast you need to turn it daily or every other day. This keeps the aeration high which ignites the whole process. If you don't turn it you have a static pile that will take several months to break down. Pick a tumbler that you figure you can turn. A tall, strong young man could likely handle any tumbler. Someone like me should look carefully for one where reviews never say I had trouble turning it. I really hope the composting tips for tumblers help you avoid some of the common pitfalls of using this potentially good tool. Follow these composting tips and you'll be happy with your purchase. If you haven't decided which compost tumbler you want to try I'd like to invite you to our compost tumbler section. Here you'll be able to easily compare some of the most popular tumblers available. Here are some other pages you might find interesting on this site.